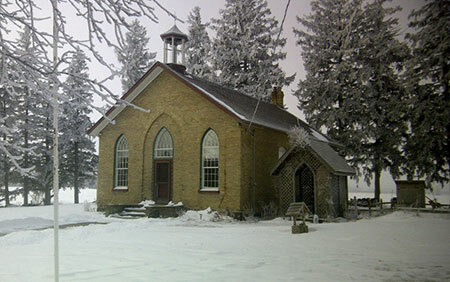 “Always learning: Notes from a country schoolhouse” would be the name of my blog, if I had one. I don’t think I have enough time, or thoughts, to be able to have a regular blog though, so I thought I would hijack Amanda’s. Just for a trial run. It is wintertime, and everyone seems to be drawn to “comfort foods.” Different people and different regions will have a unique definition of what this means. For me, things like meatloaf, mashed potatoes, chili and pastas. Generally speaking, not soup. I’m just not a soup person. Anyway, after I got the chicken in the oven, and had the rice cooker ready to rock, I started to think maybe I should make soup out of the chicken carcass. Don’t ask me why. I’d only ever made soup once before. As I said, I’m just not a soup lover. I’m guessing it was that draw to “comfort food” having its affect on me. The following afternoon on my way home for work I realized I needed carrots, onion and celery to start my soup. (Why exactly we use those three to make a base – mirepoix – I have no idea.) I knew I had onions at home, but likely not carrots and most definitely not celery. Realizing that I would never use an entire bunch of celery, even if it would last for a year in my fridge, I came up with an alternative way of getting what I needed. I went to the local Casey’s Grillhouse, had a beer and ordered a side of celery and carrots to go. Just 99 cents! Brilliant! I got just enough and wouldn’t have the leftovers rotting in the veggie drawer. 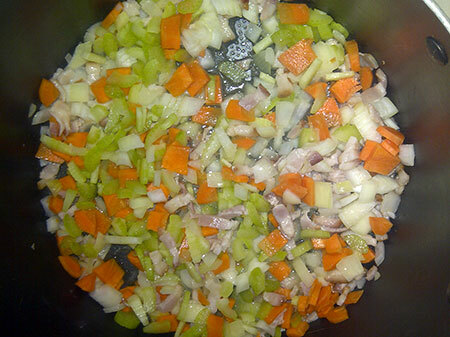 The making of mirepoix, onions, carrots and celery. My memories of dumplings as a kid would not fall into the “comfort food” category. My mother is a fabulous lady. Happy, generous and still pretty spry for close to 80, but she has never been a great cook. Dumplings as a kid were these lumpy doughy things that were likely meant to fill a person up, but really had no flavour or appeal. And she wanted me to make dumplings? Okay, why not. Most things I try come out better than they should, so it was worth a try. I found a recipe online that sounded okay, and got mostly good ratings. This one single recipe has made me a fan of soups again and made dumplings one of my new favourite foods. They are soft, smooth, melt-in-your-mouth yumminess. I used this Bobby Flay recipe on foodnetwork.com with some small tweaks. Bring the milk and butter to a boil, add salt and nutmeg. 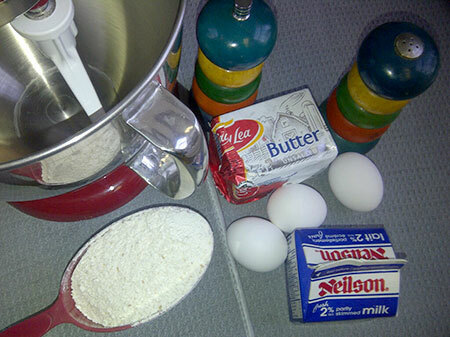 Remove from heat and immediately add flour stirring until dough leaves the sides of the pan. Incorporate the eggs, 1 at a time, forming a sticky dough. Bring soup to a nice boil. 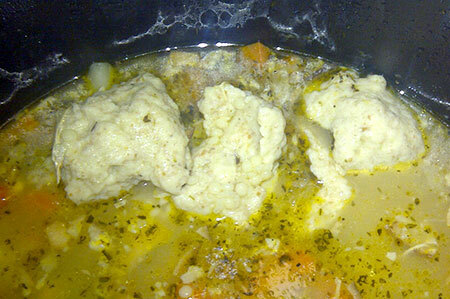 Add spoon-sized balls of dough and simmer until dumplings rise. I roasted a chicken again this week (this time stuffed with a head of garlic) just so I could make soup with dumplings again. Great post and I would definitely follow your blog! Feel free to come over and make some of your food for Cindy and I. Looks delicious and I never think of adding dumplings to soup… I guess that’s because I’m Italo-Canadian. Definitely will try that next time with this recipe. Also did you add only the carcus (which I’m thinking of as just the bones) or save pieces of the chicken meat to add to the soup as well? Nice post got a few interesting ideas from it, thanks! Just happened on to this, Warren. I’ve been busy putting in a new kitchen and now I don’t know why as I will never produce anything close to the wonders that come out of yours. I seem only to heat M&M dinners in mine. I must get down your way to see you and my daughter. I might just come at a time when you are having chicken soup and dumplings. SO, if you want to keep me away, don’t put such great mouth watering Blogs on my computer anymore. I’m appear to be starving now and I wasn’t a few minutes ago.